While most of us like to hang on to certain things for sentimental reasons (for example, baby clothes, kids craft projects and old furniture we think we might need), others have such a compulsion to collect things that it negatively impacts their life. Hoarding habits eventually lead to the accumulation of large amounts of useless items that are only suitable for landfill. This is where Clean Up Gold Coast and our hoarding rubbish removal service can help. Squalid living conditions – untouched areas of junk are unsightly and attract rats, cockroaches and insects. 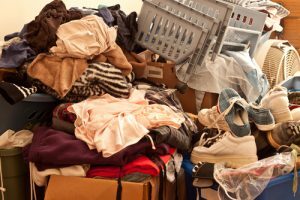 Financial hardship – hoarders often buy more than they need. Relationship Problems – hoarding behaviours may impair the sufferer’s ability to function socially or maintain a job. Read more about compulsive hoarding or talk to your doctor if you are concerned about your health. So, how can we help? Clean Up Gold Coast is a professional team of rubbish removal experts, who put the needs of our clients first. We deal with all types of sensitive rubbish removal, including deceased estate rubbish removal and hoarding rubbish removal. All you have to do is let us know what needs to be removed and we’ll do the rest. View our rubbish removal costs or contact us for a personalised quote.